to love all (celibacy), to share our lives (poverty) and to listen and respond to the needs of the world (obedience). Want more on Wider Network? This local community of Christian Brothers have declared their aims and have split them into three categories: Community, Spiritual Search (or Prayer) and Compassionate Action. Breathing Space is an opportunity to explore and share your faith journey in a safe environment with others. It's a journey of the heart, meeting monthly for 7 sessions, for two hours in hospitable, non threatening surroundings. Br Christy Turner is from Cork. He joined the Christian Brothers at 15.After his formation, he taught in primary school. Later, he qualified to teach in secondary school. When Ireland joined the EEC in 1973, the Provincial Council sent brothers to France to learn French. Christy took part in this initiative and spent some time there learning the language. He went on to teach French in secondary school. After retiring from teaching, he joined the mission in South America. After studying Spanish in Dublin and Salamanca, he joined a community of Brothers in Argentina training catechists. Next, Christy transferred to Asuncion in Paraguay, where he taught English to prisoners. His next assignment was teaching English to novice brothers in Lima. Health problems brought Christy back to Ireland in 2005 where he joined the staff in Pearse Square, Dublin, teaching pupils with learning difficulties. Four years later, he joined a Congregation initiative called ‘New Life in Mission’, which brought him to Liverpool. Br Fergus Reilly is from a place called Kells, County Meath, a very historical place in Irish history. He spent much of his life as a teacher and Principal in Belfast, Northern Ireland. He was quite involved in organizing a holiday for the students in Bray for many years, giving them some respite and freedom during the troubled period. With his interest in photography and technology it wasn’t surprising to find him attending courses in these areas and then transmitting his knowledge to his students. Fergus took a sabbatical in Berkeley, USA and, during that time, he studied spirituality. On his return to Dublin, he spent some time working as a volunteer in Merchant’s Quay with the homeless and drug addicts. In 2002, Fergus was appointed onto the Province Leadership Team, which he served for 5 years. He used his gifts in various ways during that time. In 2008 he came to Liverpool with the other Brothers in St Timothy’s. 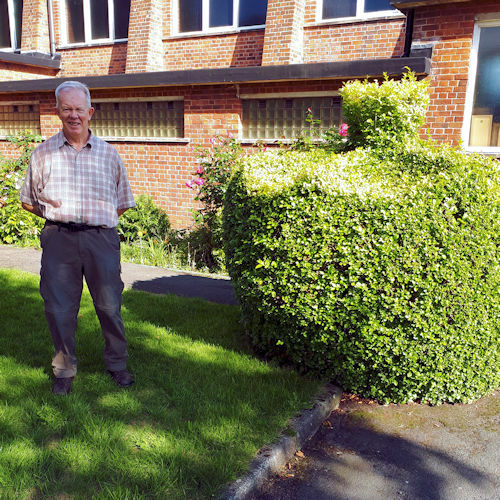 Before Br David Ryan arrived in Liverpool in 2008, he had spent many years working in various positions in Ireland. His ministry brought him to teaching both at primary and secondary level during which time he was in Dublin, Cork and Waterford. Later, he spent 4 years as Director of Novices in Bray, training young men on a formation programme and preparing them for Brotherhood. From this position, he was appointed home/school liaison officer in Crumlin, Dublin. This experience brought him opportunities to visit every child’s home, run many and varied adult education programmes and do some counselling with the most vulnerable in the school. Out of this experience, the opportunity to train as a psychotherapist arose. On completion of his studies, he worked as a therapist in the Liberties in Dublin for three years. Then David was elected onto the Leadership Team of the Province, where he worked for 11 years. This ministry was very varied. Among his responsibilities were establishing and promoting Edmund Rice Camps, pastoral care of the Brothers, attendance at conferences, promoting and supporting projects for the marginalized youth, promoting and supporting safe guarding structures for child care, accompanying complainants of child abuse, promotion of renewal programmes for the Brothers, and the visitation of our missions in Zambia and South America. Return to Info about the local community?